After a relatively late night (by my standards), New Year’s Day was very relaxed. We slept in and went to Cuellaje briefly. Then we had a late lunch, made empanadas, and sat around chatting. Usually there are some guys playing volleyball nearby in the evenings, but today there wasn’t – I assume they were all too hungover! It was a nice and relaxed start to the new year. The most distressing thing that happened was that the water ran out while I was halfway through a shower! It happens from time to time, but being in the middle of a shower was just bad timing. Luckily, I had a small pot of boiled water so I just used that to rinse myself off. A couple of days later, it was the electricity’s turn to go. It’s not an uncommon occurrence as sometimes the cables get knocked over by cars (or cattle or something like that). Thankfully it didn’t last too long – the electricity came back just after nightfall. We almost had to cook and eat dinner by candlelight (which I’ve experienced before, albeit in Apuela). Not quite as romantic as it sounds. I decided to attempt the brownies again here – it’s still a gas oven, but this time I turned the temperature up higher. 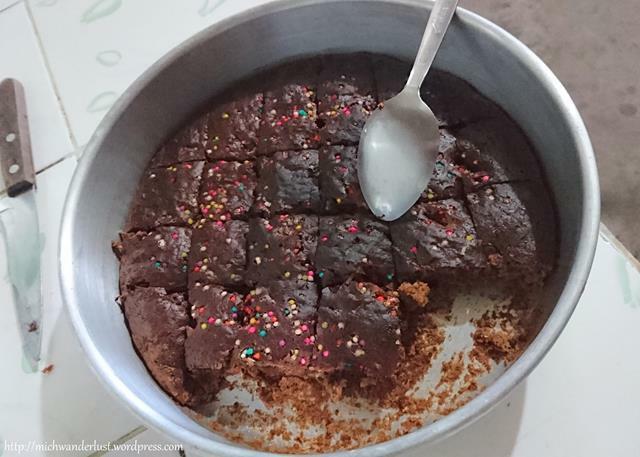 It didn’t look anything like the brownies in Quito, but it tasted fine, and that was most important. So there are a couple of kids in school who aren’t very – switched on, shall we say. There’s one little girl in particular who doesn’t seem to understand what she’s supposed to do whenever I set them some homework. I suspected that she was a special needs child, so I never said much about it and pretty much left her to do her own thing – as much or as little as she could. One day, however, she suddenly burst into tears while I was setting them homework and gave me a shock. When asked what the problem was, all I could get out of her was that she didn’t understand. I tried to explain to her what we had been doing, but she just kept on crying and shaking her head whenever I asked if she understood. After a good 30 minutes of this (which seemed interminable), the teacher came over and said that she’s special and not to worry. Good to know, I guess. On a happier note, I’ve been going through a simple storybook for kids with the 5th to 7th graders and it’s hugely gratifying that they can actually read and understand the story with just a bit of help. Sometimes I wonder if they’ve actually made any real progress in learning English (despite me spending months here) because they seem to forget so fast. But things like reading a storybook is a real and concrete sign of progress, so it’s really encouraging. This interesting fruit is called guava – nothing like the fruit known as guava to English speakers, though! You eat the white flesh surrounding the seeds, which looks a bit like cotton wool but is nice and juicy with a very subtle taste. A first for me on the culinary front:making bread by myself (although under Rosa’s supervision and instructions) – usually she puts the ingredients in the bowl and I just mix everything. We’re both conscious that I’m leaving soon, and I want to learn how to make bread so I can try it when I go home. She said that from now until I leave, I can make all the bread! Another first for me: making cheese! We have milk now because some cows gave birth fairly recently. 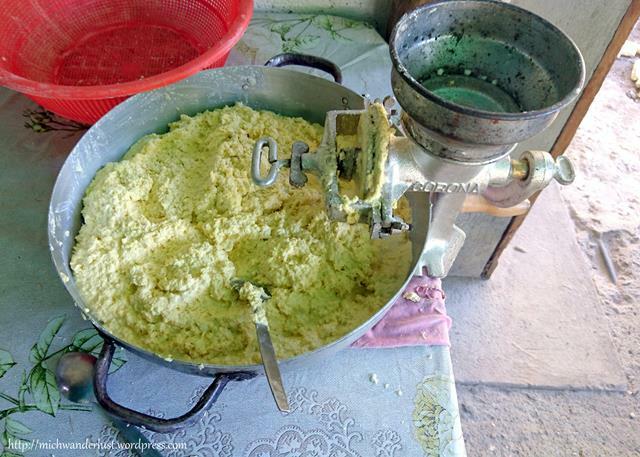 You then boil the milk and curdle it using some powder – the whole process is surprisingly fast. So then you get curds and whey, and have to make cheese from the curd. 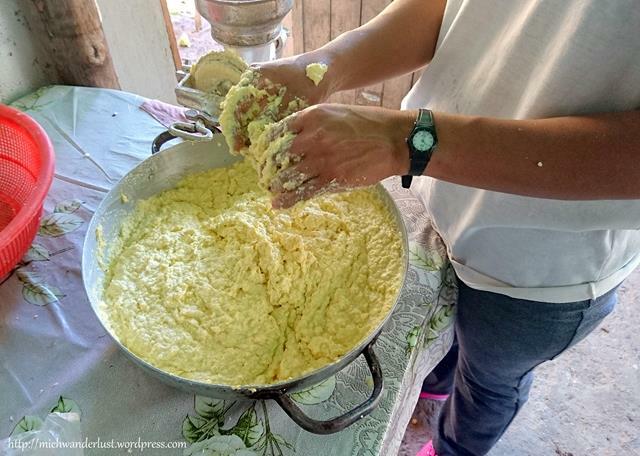 This involved scooping the curd into a round mold and pressing it down, and occasionally turning the mold upside down to compress the curd further and make the top flat. 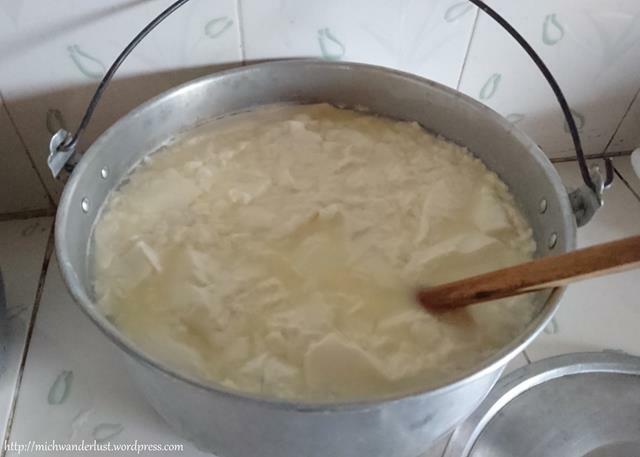 Curds and whey – looking like tau huey (beancurd)! Rosa was sick and didn’t give me much by way of instructions apart from “Just keep pressing”, but help came unexpectedly from the farmhand who lives with us and who used to make cheese a lot when he was young. I doubt I’d have been able to do it without him standing by and giving me instructions! I’ve also made a lot of humitas recently. 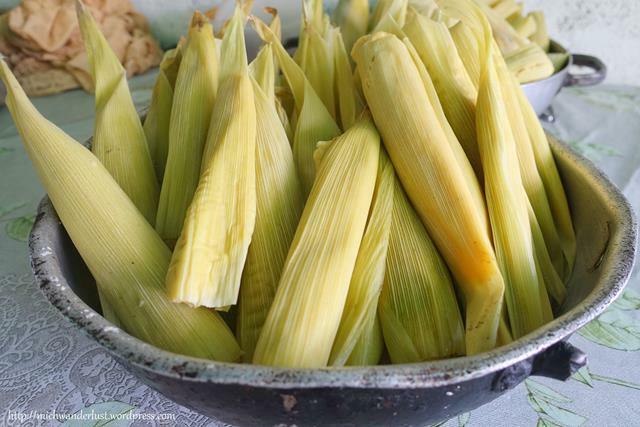 It’s a snack with a cake-like texture made from young corn (choclo). 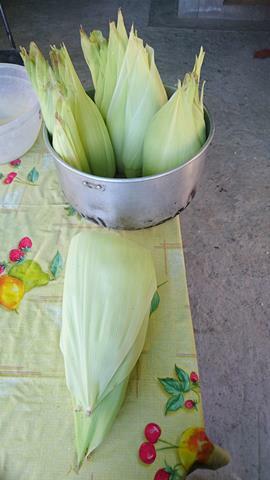 It’s pretty hard work: first you need to peel the leaves off the corn (you need the leaves later to wrap the humitas). 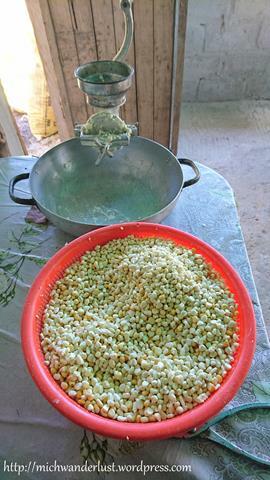 Then you remove all the corn from the cobs, and grind the corn plus some spring onions. 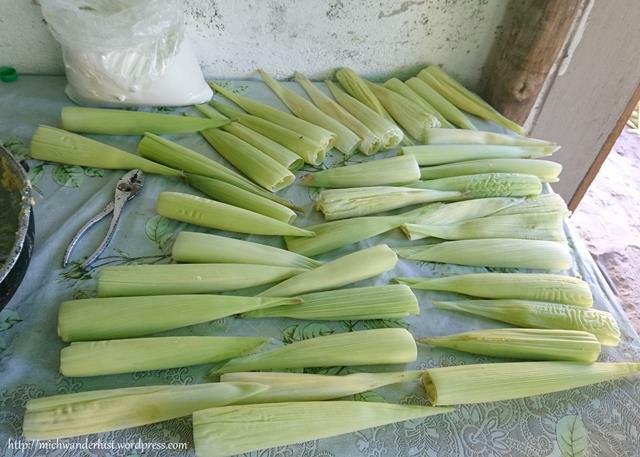 Finally, you put the batter into the corn leaves and wrap them, and steam them for an hour or so. 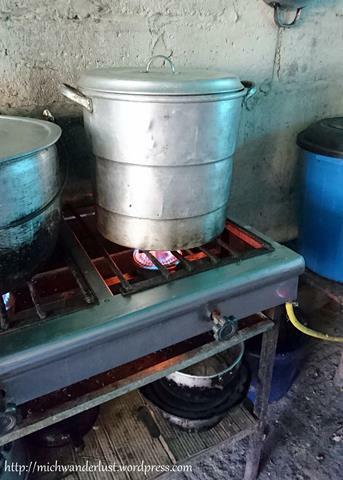 The pot they use to cook humitas (and quimbolitos) is a specific kind of pot called a tamalera. 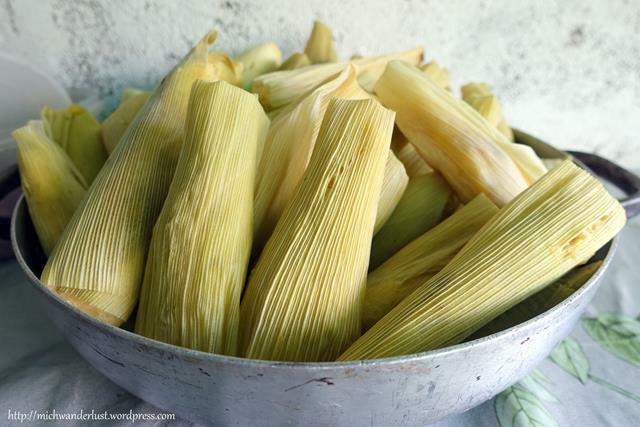 And there you have it – humitas! We made both sweet and savoury humitas – they looked exactly the same so we folded them differently in order to be able to distinguish them! 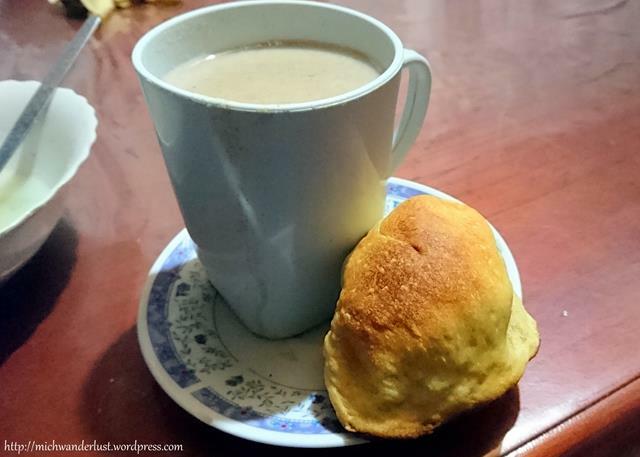 Savoury humitas are typically eaten with coffee (below). 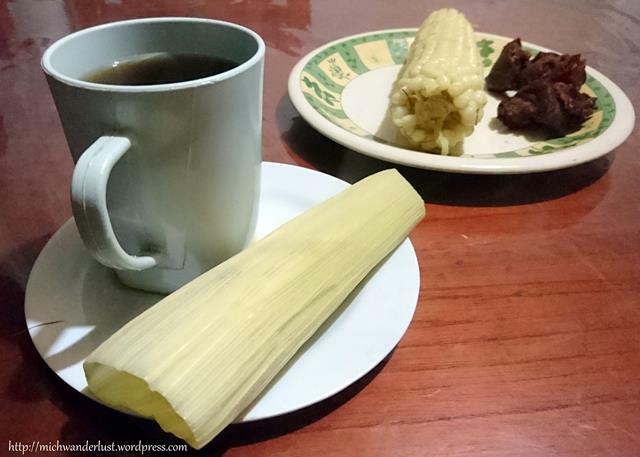 For this particular dinner, we also had choclo on the cob with fritada (fried pork). 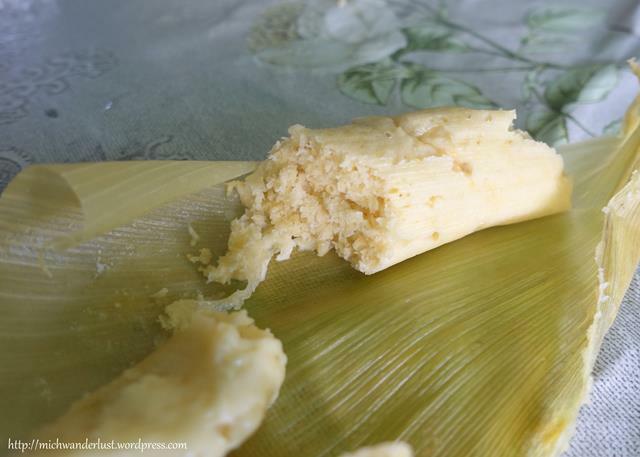 It’s really sad that I won’t be able to enjoy humitas anymore after I leave Ecuador. I don’t think I can get hold of the leaves! Speaking of food, I thought I’d be sick of the food here by now. There isn’t a ton of variety: lunch typically consists of rice, some type of beans, some form of veggies (sliced tomatoes, cucumber, onion and tomato salad with tuna sometimes, half an avocado) and protein sometimes (chicken, egg, more rarely pork). Fried banana slices are awesome, by the way. They go surprisingly well with rice. 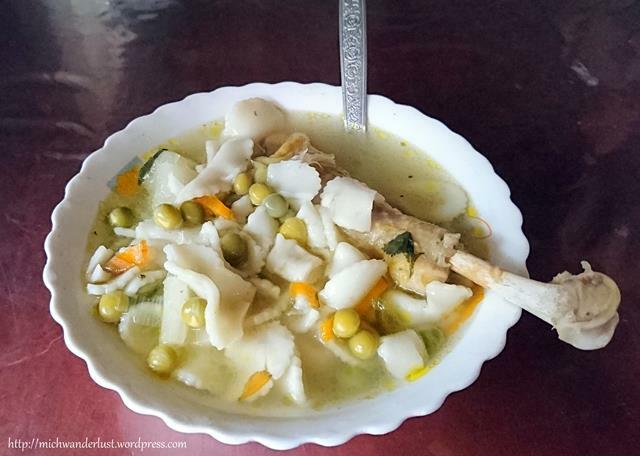 Dinner is usually a thick soup consisting of potatoes, onions, carrots, cilantro, cabbage, rice / oatmeal / flour (which makes it thick) and sometimes meat or eggs. And to drink – coffee / aromatic water (boiled with herbs such as cedron and with a ton of sugar added) / colada (a thick milk-based drink with oatmeal, pumpkin etc.) 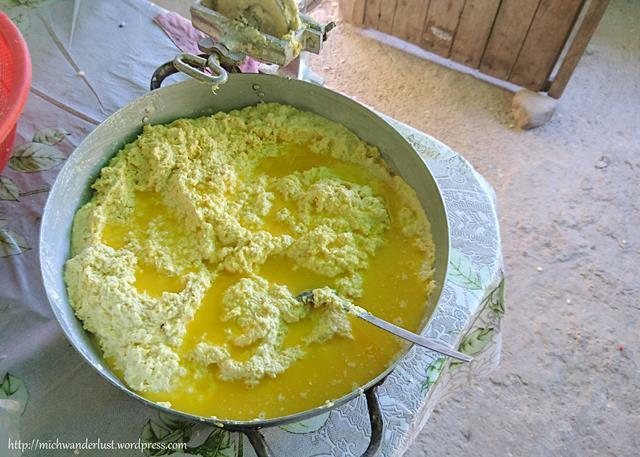 with bread or whatever snack is on hand, like humitas. Sometimes we have rice for dinner, like lunch. Once in a while we have noodles as well – with rice. I’ve never been a huge fan of rice, but it’s a diet staple in Singapore as well so I’m used to it. 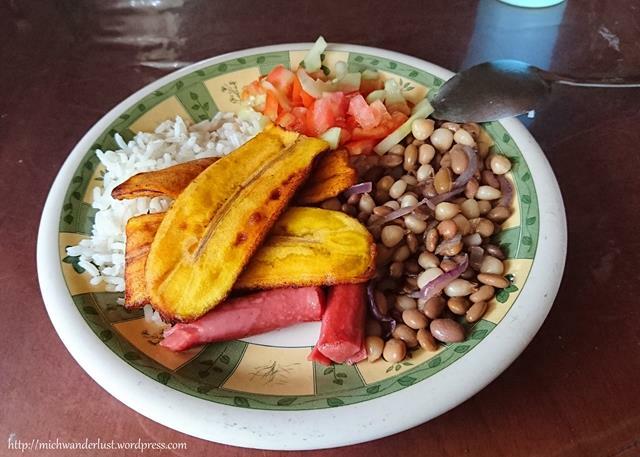 What I wasn’t used to was having so many carbs at once: you can get potatoes, noodles, beans and rice at the same meal! Definitely not helpful for weight loss purposes. And yet, despite the lack of variety and the carb overload, I can’t get enough of the food here. 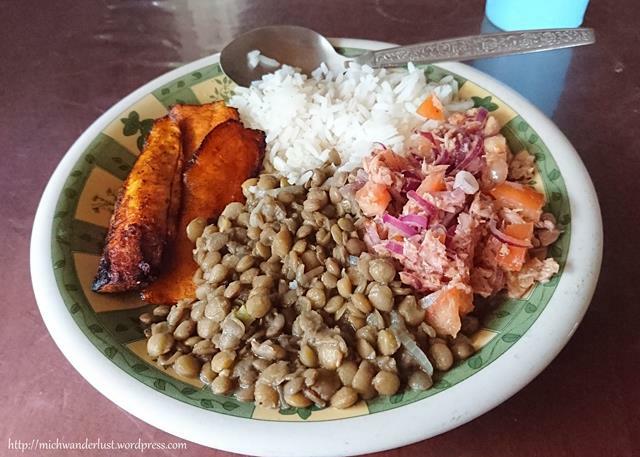 I know I’m going to miss Ecuadorean food when I go back, and I definitely want to try replicating some of it at home. Those brownies seem delightful, Michelle. Can I have the recipe?